In November 2017 the Times Educational Supplement (TES) published an article under the headline ‘Teaching grammar does not improve children’s writing ability, research finds’ (Bloom 2017). This article provoked a positively gleeful response in the comments, with many respondents seeing it as validating their dislike of the way in which grammar is currently integrated into the curriculum. Comments described the ‘politicians and pedants’ who have wrecked the enjoyment of English, and expressed the idea that grammar is ‘stifling creativity’. This tendency to posit an opposition between grammar and creativity is a clear trend among some practitioners (Watson 2015a). However, it has been vociferously opposed in some quarters – including in a practitioner-written TES article published a few months prior, which discussed the creative potential of playful approaches to grammar (Nangtonwe 2017). So what has caused this dichotomisation of grammar and creativity? One issue is the multiple ways in which the concept of ‘grammar’ can be construed (see for instance Hartwell 1985). When the coalition government revised the curriculum (DfE 2014), the inclusion of ‘grammar’ appeared superficially to align with the ‘back to basics’ narrative of the reform. Grammar is often conceptualised as the ‘building blocks’ of language (Watson 2015a), and this language – of basics, fundamentals, building blocks – is exactly that with which Michael Gove, then secretary of state for education, set out his vision for the curriculum (see for example Gove 2013). However, the argument that grammar should form one of the ‘basics’ of education conflates two distinct ideas. The concept that grammar is fundamental to language is obviously true in one respect: descriptive grammar is an attempt to define the patterns through which words combine to communicate meaning. On the other hand, the notion that explicit declarative knowledge of metalinguistic terminology is somehow a ‘basic’ prerequisite of expert language use is self-evidently untrue. Curriculum documents enact this tension between meaning-oriented and form-focussed approaches to grammar. In some places grammar is framed in descriptive, communicative terms, as in the year 5 and 6 writing focus on ‘selecting appropriate grammar and vocabulary, understanding how such choices can change and enhance meaning’ (DfE 2014). In other cases – most notably the key stage 2 grammar, punctuation and spelling test – explicit declarative knowledge of metalinguistic terminology is divorced from any association with meaning or effect. While the introduction to the English programme of study states that the focus on spelling, grammar, punctuation and ‘language about language’ is ‘not intended to constrain or restrict teachers’ creativity’ (ibid), this is clearly what some teachers feel it has done. The pressure of accountability measures and high-stakes testing inevitably drives some teachers to restricted, form-focussed or formulaic approaches to teaching writing (Watson 2015b; Dean 2016). And, for some, grammar has become the enemy. Of course, this is only part of the picture. There are opportunities to integrate explicit attention to language with other well-evidenced instructional approaches in order to form a balanced pedagogy that allows space for creativity. Safford (2016: 26) presents a perhaps surprisingly positive picture of teachers’ attitudes to the grammar element of the KS2 test, noting that, Teachers who contextualise the study of grammar in the reading of literature and discussions about real life texts reported a positive impact on pupils’ writing’. Last year, Michael Rosen, an influential author and outspoken opponent of the KS2 grammar curriculum, recently published his vision for ‘teaching grammar to 9–11 year olds’ (Rosen 2017). It is remarkable how similar many of his ideas, including the focus on creative ‘imitation, parody, and invention’, are to the pedagogy developed by the Centre for Research in Writing at the University of Exeter, which is subject to a process of ongoing refinement through multiple research studies. One of the more recent studies is an expansion of the EEF study critiqued by Wyse and Torgerson (2017), which also has a qualitative element allowing us to look closely at the role that metalanguage might play in developing (or confounding!) student understanding of writing, and the role that talk about language more generally has in student learning. A full project report is due in the autumn, and results of the qualitative study this will be discussed at the BERA Annual Conference in September 2018. Annabel Watson will be presenting in a symposium at the 2018 BERA Conference at Northumbria University, on ‘The Role of Linguistic and Metalinguistic Knowledge in Writing Development’ (9.00–10.30, Thursday 13 September, room CCE1-412), where she will be joined by John Hodgson (University of the West of England), Ann Harris (University of Huddersfield) and Debra Myhill (University of Exeter). 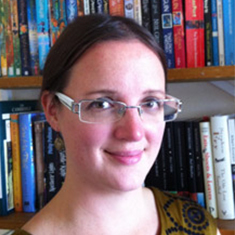 She is a member of the Centre for Research in Writing at the University of Exeter, programme director for School Direct PGCE and Secondary English PGCE lead. Prior to working for the University, she was a teacher of English and Media Studies in Greater London and Devon.